Evolution is a smash hit! On March 11 and 12, UCMP hosted its fifth annual short course, Tracking the Course of Evolution. The event was co-sponsored by Orville and Ellina Golub and the California Science Teachers Association. 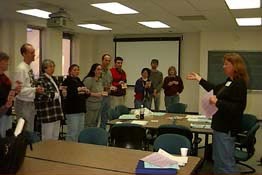 Over 90% of the 200 or so course participants were K-16 teachers, interested in gaining (1) a greater understanding of evolution, (2) new insights into the teaching of evolution, (3) a clearer idea of how science differs from religion, and (4) the opportunity to share thoughts and concerns with colleagues. Saturday provided the chance to listen to a series of stimulating lectures on topics ranging from the origins of life to systematics and human evolution. This was followed by a panel discussion, the opportunity for questions, and finally the chance for more casual conversation during a reception. Sundays workshop provided more time for conversations focusing on the differences between belief knowledge and research knowledge and the chance to participate in a series of classroom activities in support of major concepts of evolution. 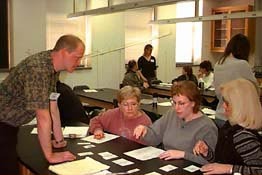 Allen Collins (left) leads a workshop called Fun with Phylogenetics at the Tracking the Course of Evolution short course in March. See the short course website for program details.